Wolverines are the largest member of the weasel family and they are the second largest mustelid, giant otters being the largest. They have a body length of 65 - 105 cms (26 - 41 inches), a tail length between 17 and 26 cms (6.5 - 10 inches) and they weigh between 8 and 14 Kgs (18 - 31 lbs). 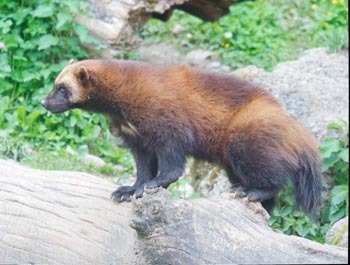 Male Wolverines are generally approximately one third larger than females. Wolverines are strong, stocky, bear like animals with extremely powerful jaws that can crunch through frozen meat and bone. 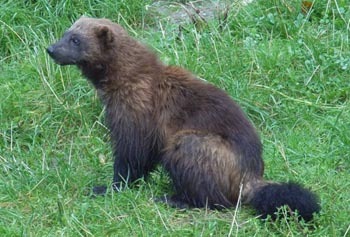 It has long, dense fur that doesn't retain much water making it very resistant to frost in the Wolverine's cold habitat. They are black/brown in colour with a pale brown band down each side, a long tail and they have been known to give off an extremely strong and unpleasant odour. Wolverines are found in isolated areas of Canada, North West USA, Northern Europe and Northern & Eastern Asia. They live in dens amongst roots and rocks or sometimes they dig one into a snow drift. They are solitary animals and they have a very large range. Males defend a territory up to 620 Kms (385 miles) while females have territories between 130 and 260 Kms (81 - 162 miles). The territory of a male will overlap several female territories. Wolverines roam around a lot and they can travel up to 24 Kms (15 miles) per day. Wolverines are omnivores but their diet mainly consists of meat. They are known to eat deer, hares, rodents, birds, eggs, carrion and seasonal fruits. (3 oz) and they will remain with their mother until they are weaned at approximately 9 - 10 weeks old. By late May the young will move around with their mother and they are usually fully grown by the winter. After their first winter they may venture out on their own or they could remain in the same areas as their parents or siblings. 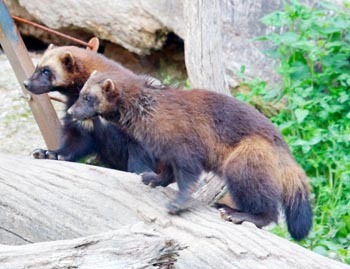 Wolverines become sexually mature at approximately 2 years of age. Predators of the Wolverine are humans, mountain lions, wolves and bears. The Norwegian municipality of Bardu has a Wolverine in its coat-of-arms. The US state of Michigan is known as the Wolverine state.